Wi-Fi is brilliant, it enables all of us to stay connected to the world around us whenever, wherever we are. However when something goes wrong and the Wi-Fi connection becomes corrupt, you can quickly find yourself locked out of the network you need to connect to the most, unable to find a way back in. Fortunately Windows 10 makes it simple to repair this problem, though the caveat here is you will need to know the Wi-Fi password (if there is one) the next time you reconnect. To achieve this, open Settings and navigate to Network & Internet > WiFi, where you will see a link called Manage known networks. Clicking this displays a list of all the Wi-Fi networks for which your PC has stored information. Click the troublesome network and a Forget button will appear. As I have mentioned, this deletes all the settings for that particular Wi-Fi network, so the next time you connect to it you will need to know its password (if there is one). 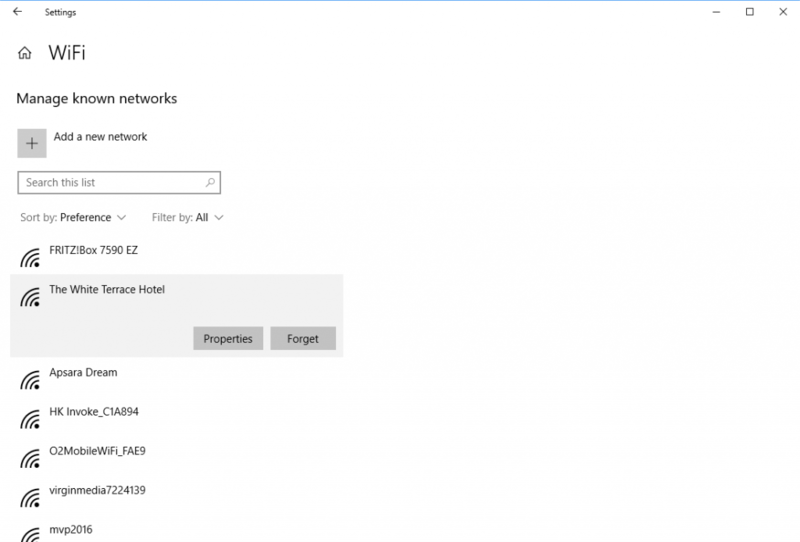 If you have signed into your PC using a Microsoft Account or an Azure AD account and have settings sync turned on in Settings > Accounts > Sync your settings then the refreshed settings for the Wi-Fi network will be automatically synchronised to all the other Windows 10 devices on which you sign in using the same account.